Order both books together and get free postage. 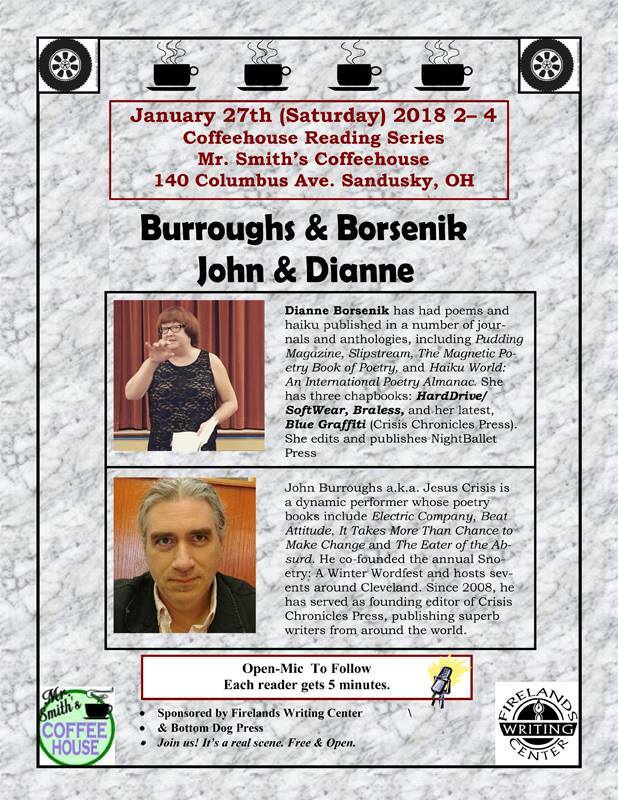 I look forward to being the featured poet this Saturday, 13 January 2018 at Mr. Smith's Coffee House in Sandusky, Ohio. 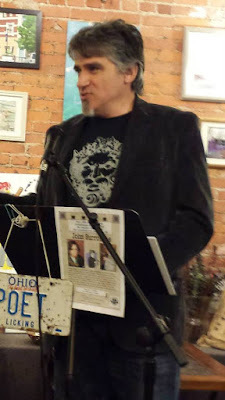 Larry Smith and the Firelands Writing Center are always such wonderful hosts, and the venue and people are always so warm and welcoming, that I don't even mind so much that I might have to drive well over an hour each way in a snowstorm to join them. There will be an open mic as well. So please come help us heat up the city! Earlier this week, I calculated total sales and expenses for Crisis Chronicles Press. Our expenses were higher in 2017 than in any other year since our founding (in 2008). Meanwhile our total sales in 2017 were the lowest they've been in any year since I began keeping comprehensive records (in 2012). Take a break-even endeavor, increase expenses and significantly decrease revenue and, well, despite my best efforts, it becomes even less sustainable than it already was. Several great small presses went under in 2017, and I can understand why. But don't worry. If this one ever does, we will fulfill all our publishing commitments first. I'm very excited about the 12 books we have coming out in 2018, and I know you will love them. Meanwhile, please feel free to buy some of our great already published titles to support this ongoing work. And thank you from the deepest chambers of my heart to those to have already done so (in some cases, repeatedly) these past 10 years. However long it lasts, it's been a good run. 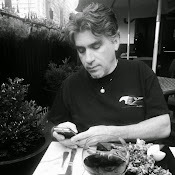 It's been about 6 months since I shared links to new Crisis Chronicles Press book reviews on this, my personal blog, so here are a number of reviews and other accolades that have come to light since that time. 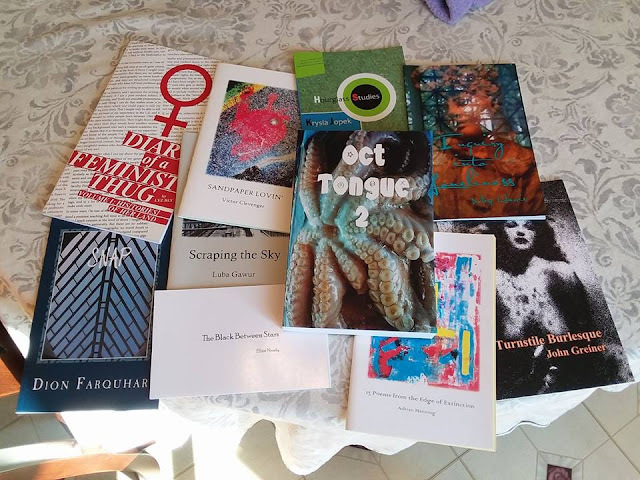 I feel extremely grateful to be associated with such wonderful authors and books, and am especially grateful to the kind souls who not only enjoyed these books but have gone the extra mile to share their thoughts about them publicly. Review by Matthew Hall in Screaming with Brevity. Review by John Greiner at Goodreads. Nominated for a 2018 Ohioana Book Award. Review by Randy Brooks in Frogpond. Editorial review in the inaugural issue of Scryptic. Nominated in its entirety for a Pushcart Prize. 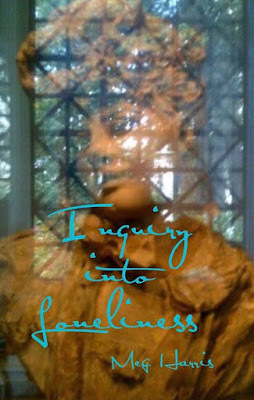 "Love Letters" from this book nominated for a Pushcart Prize. Review by Kevin Hinman at Goodreads. Review by Carrie Crow at Goodreads. 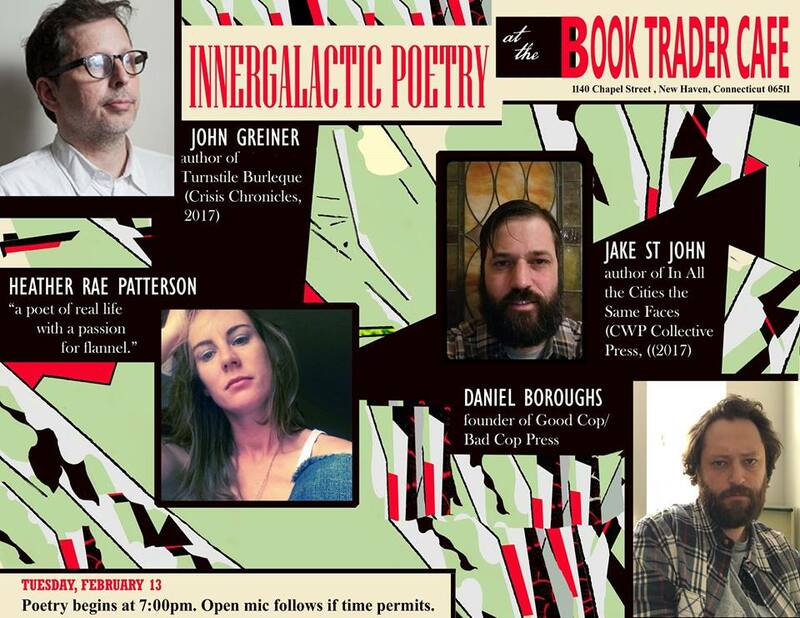 "Jane in Her Business Suit" from this book nominated for a Pushcart Prize. Review by Christina Brooks at Goodreads. Review by Michelle Reale at Rag Queen Periodical. Reviews by Marcia Trahan, Christina Brooks, Jennifer Juneau and many more at Amazon. 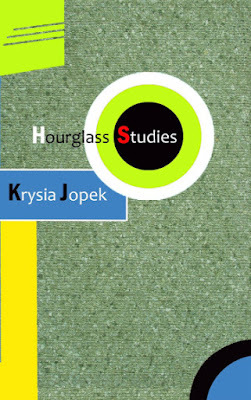 "Crystal" from this book nominated for a Pushcart Prize. Review by John Sweet at The Bleeding Horse, Avenged. Review by Chris Stroffolino at Thing. Review by Will Mayo at Goodreads. George Wallace's "America, Land of the Bitter" from this book nominated for a Pushcart Prize.